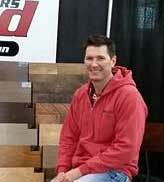 About Us : Wildwood Floors, Inc.
Jody Fencl, owner of Wildwood Floors, created the company in 1996. Originally, the business was based in Cedar Rapids, IA with a focus on serving residential and small business customers. In 2004 Wildwood Floors expanded it's reach to Des Moines and throughout the rest of Iowa. The company has continued steady growth, and in 2007 was divided into two separate owners to better serve major regions in Iowa. Currently Wildwood Floors has a strong connection to Des Moines and the surrounding area by serving all sizes of businesses and residential customers. Projects range from small to large and involve new construction, remodeling and refinishing. Wildwood Floors, Inc. is dedicated to providing the highest quality service through repeat and referral business achieved by customer satisfaction in all areas including consultation, best products, timeliness, and attention to detail. A note to thank you for a well done job on our wood floors. We’ve had different people in the building also comment on them. Your response to come and do the different stages of the job were also excellent after I called to schedule the work. The people installing and finishing the floor were also pleasant to work with. Copyright © 2019 Wildwood Floors, Inc.